V-Belt Sheaves and Round Belt Pulleys – BNB Industries, Inc.
V-Groove Sheaves and Round Belt Pulleys are used for idlers rollers for urethane round belt and V-belt type conveyors, tension or pressure sheaves on belt driven live roller conveyors and idler pulley for cable or can line type conveyors. 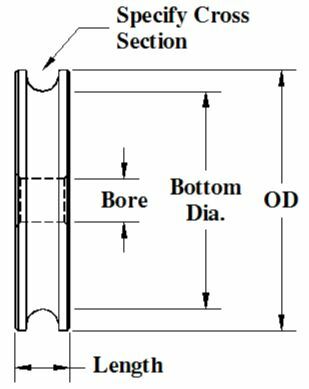 Specify the material the sheave is to be manufactured from, OD of the sheave, the Length of the sheave, the cross section of the groove ( 3L, 4L, A, B, C, etc. ), and the Bolt or Shaft size to be used. When a bolt is used for mounting the sheave to a frame or bracket, they can be purchased with or without the spanner and washers and mounting hardware to make up the assembly. 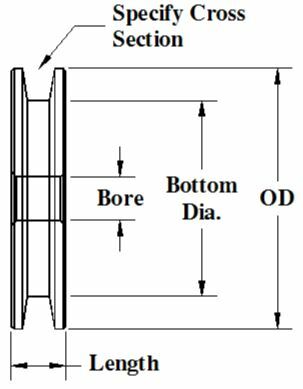 Specify the material the pulley is to be manufactured from, OD of the pulley, the Length of the pulley, the cross section of the groove ( 1/4”, 5/16” 3/8”, etc. ), and the Bolt or Shaft size to be used. The self lubricating plastics that the components are offered in are very strong while offering chemical, moisture and abrasion resistance. Be sure to use the technical information section of the catalog to choose the correct material for your application subject to the heat, load, speed and chemical resistance requirements for your application.